We consider the motivations of long term contract counterparties at the negotiating table, in order to understand how these impact the pricing of contracts. The pricing terms of long term contracts on flexible gas & power assets are typically the subject of lengthy negotiations. They also often remain a closely guarded commercial secret. This is reflective of the bespoke nature of these contracts and the large sums of money involved. Long term contracts are used to underwrite investment in a wide range of flexible assets including midstream gas assets (e.g. pipelines, storage facilities and LNG terminals) as well as thermal power plants and electricity interconnectors. Pricing terms vary widely across different asset types and counterparties. But behind the negotiation of individual contract pricing terms there are a set of common principles that apply. We recently published our first article in a series on the long term contracting of flexible assets. In our second and third articles in this series we focus on the drivers of contract pricing. In today’s article we consider the motivations of the contract sellers and buyers at the negotiating table, in order to understand how these impact the pricing of contracts. We then set out a practical explanation of the 5 key drivers of contract prices in our next article in the series. The sellers of long term contracts are typically asset owners. Contract sales may be to support the development of a new asset (e.g. a CCGT tolling deal) or to manage the margin of an existing asset (e.g. sale of pipeline or storage capacity). Either way long term contracts involve the structural transfer of asset exposures from seller to buyer. This means exposure management plays an important role in shaping the motivations of contract sellers. The first two of these factors are intimately related. The seller of a long term contract is principally focused on how pricing terms will impact the risk/return profile of the underlying asset (as we set out in detail here). The contract price level needs to support an adequate return on capital employed. But the pricing structure also needs to deliver that return within a tolerable level of risk. Take for example a gas storage operator looking to sell long term capacity to support the incremental expansion of a storage facility. Current weakness in market price signals (seasonal spreads and spot volatility) make it challenging to sell long term capacity contracts at a price level that supports investment. In order to increase returns, the storage operator can seller a lower volume of long term contracts (i.e. retain more market risk). Or alternatively they can introduce some degree of market indexation into contract pricing terms (e.g. spread indexation). But either way these decisions impose additional risk on debt and equity capital invested in the project. Seller’s negotiation of contract pricing terms revolves around balancing these risk/return considerations. Route to market (factor 3. above) only applies to a subset of long term contract negotiations. It relates to using the counterparty (or buyer) to access the commercial capabilities required to monetise asset value (e.g. a trading capability). This is typically only a concern for asset owners that do not have an internal marketing and trading function. But route to market agreements are becoming an increasingly common feature of long term contract negotiations, given the growing importance of infrastructure investors without a market facing capability. Route to market contract terms typically cover a fixed service fee combined with variable execution fees. These may be negotiated separately from the structural pricing terms of long term contracts. However it is often the case that both pricing and route to market terms are agreed at the same negotiating table with the same counterparty. This means that route to market capability and cost competitiveness can influence a seller’s attitude to contract price terms. Like for sellers, exposure management considerations play an important role in shaping buyer motivations. The characteristics of these buyer types are summarised in Chart 1. Category 1 and 2 buyers are characterised by risk aversity and a focus on maintaining security of supply. In the case of a system operator this is about contracting adequate levels of flexibility to maintain system integrity. For a physically focused supplier (e.g. a gas distributor) it is about ensuring continuity of service to a customer base. This security of supply focus often means long term contracts are priced on an insurance premium basis rather than a purely commercial basis. 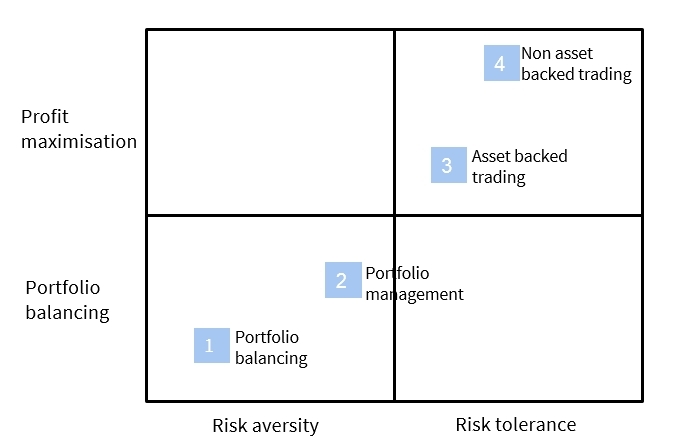 Category 3 and 4 buyers consist of trading desks that have a greater risk tolerance and market focus when negotiating contract pricing terms. These buyers typically price contracts based on expected merchant returns. However they apply a haircut (or discount) to merchant value to reflect the costs of monetising contract value in traded markets. We will come back to contract haircuts in our next article, but they are primarily driven by the risk capital costs of associated trading activity. Different buyer motivations can be illustrated via a long term gas storage contract example. The appetite of a commodity trading company to sign a storage contract is driven by the expected returns that can be made via optimising storage capacity against liquid gas hub prices. A gas distributor on the other hand is driven by a requirement to secure a certain minimum volume of physical storage flexibility within its portfolio in order to maintain security of supply to its residential customer base. This decision is driven by the costs of alternative sources of flexibility rather than the value of optimising storage capacity against the market. The pricing terms of a long term contract need to align the interests of the contract seller and buyer. This means satisfying the risk/return (and potentially route to market) requirements of the seller. And doing so with a pricing structure that offers value to the buyer. This process is usually facilitated by the exchange of draft term sheets between the sellers and prospective buyers to narrow down potential counterparties. Pricing terms are only one of many points of negotiation. But they are typically the most important. Differences in buyer motivation often lead to confusion as to whether long term contract prices are driven by merchant returns or insurance premium dynamics. The answer is often both. Merchant returns, adjusted for an appropriate haircut, provide a base level of support for contract prices. This is because there are a range of counterparties competing to access margin from the commercial optimisation of contractual flexibility. These include commodity trading companies (e.g. Danske Commodities, Mercuria, Trailstone) as well as asset backed traders (e.g. RWE Trading, BP, Statoil). However physically focused buyers may pay a higher price for contracts than that implied by merchant returns, if driven to do so by portfolio security of supply or risk management requirements. Take for example a transmission operator that needs access to physical gas storage flexibility to support system balancing. The extent of the insurance premium the system operator is prepared to pay comes down to the availability of alternative sources of flexibility (e.g. other storage capacity, line pack, production swing). And this is where there is typically a circularity back to market driven returns. As European energy markets evolve, differences in the pricing of gas and power flexibility across asset types are increasingly being arbitraged away via access to liquid markets.